Leave a Comment on IT’S HERE!! I did it! I now have a published cookbook! Finished it last night, uploaded and published thru Smashwords before I had a chance to chicken out. 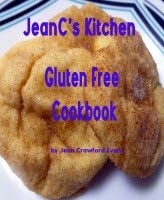 So it is live and for sale for $1.99: JeanC’s Kitchen Gluten Free Cookbook: Favorite recipes, now gluten free.